Hi everybody. 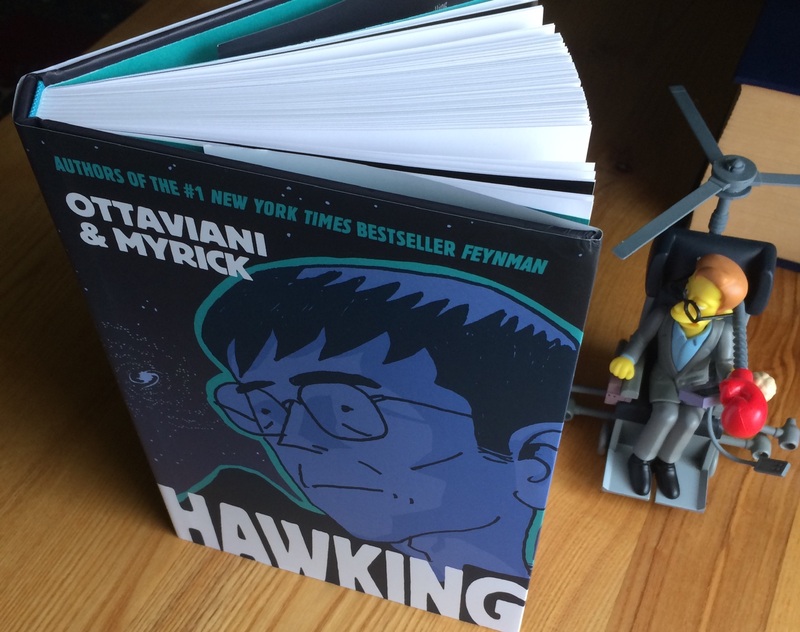 This book is real, in that you’re now looking at an actual copy…or looking at Hawking looking at a copy, depending on which photo you checked out first. So if you haven’t already, you can pre-order from your favorite retailer now. Because it’s real. Really real. As mentioned a while back, I also have a new website, and to test out the store here’s an offer to one and all. The first ten orders of any book there will get a free copy of one of my other books. 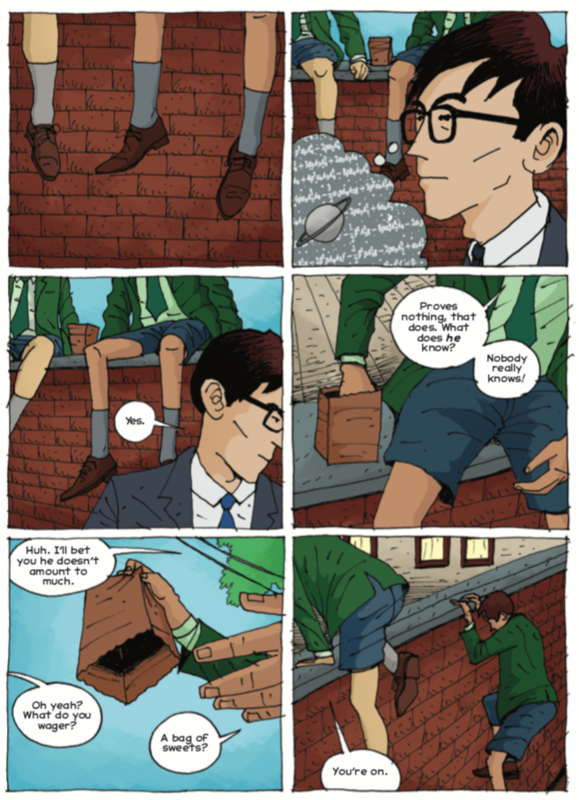 I have Feynman, The Imitation Game, and even a copy or two of T-Minus to give away, not to mention the self-published titles. and let me know your preference(s) in the “Order notes,” especially if you’re quick on the draw and don’t want that Hawking ARC. No guarantees I can give everyone the book they request, but I’ll try! And thanks, readers and friends. 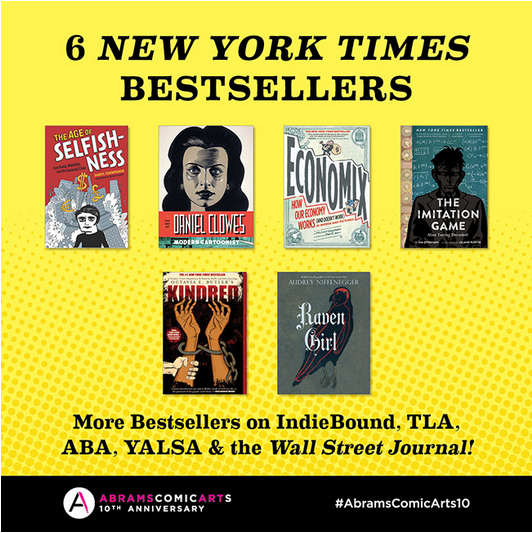 I’ve had the honor of working with many great people and publishers, and Abrams is one of the latter, filled with the former. They celebrate their 10th anniversary this year, and are doing so with some really cool events, like a show at The Society of Illustrators. They’re also doing a cool giveaway, which you’ll want to enter. So thanks to Charlie, Nicole, Orlando, Pam, Maya, and everyone else there for inviting Leland and me into such good company. And congratulations on ten years of superb books; I look forward to many more decades of great reading! We just watched the Netflix series “Losers” (which we learned about through Nick Bertozzi’s (@NickBertozzi) involvement on storyboards) and it was both short and great. If you enjoy good storytelling and don’t mind some sports in the mix you’ll like it. Justin Verlander, after a season that began on the disabled list and proceeded through to some minor league play and a so-so W-L record, started a kind of nothing late season game (the Tigers were a bad 59-66 at that point, the Angels a barely average 64-61) that night, and we were relaxing at the ballpark because night baseball in Detroit is relaxing. But as the game progressed and he kept pitching and kept striking out batters it got exciting. Kat—still pretty new to all this—was confused by all the cheering, since on the face of it the game was getting kind of boring by the time of the 7th inning stretch. Since I’ve been watching since I was a kid and was a particularly superstitious kid at that (in Little League, when things were going well for my team, I ate the exact same Cobb salad…with turkey instead of bacon…before every evening game) I hadn’t pointed out to her that Verlander hadn’t given up any hits and only two walks until she asked. The Tigers won easily, Verlander completed the game, easily, but it wasn’t a no-hitter in the end. Watching him as he threw one bad pitch that caused him to miss out on this by, literally, an inch, was simultaneously not fun and the very definition of seeing professionalism in action. It was a great night for fans, and we cheered until he came out for an encore. Well, okay, it’s not like he threw more pitches, but the usually stoic Verlander seemed touched by how much we appreciated the show he’d put on. A win. We were watching a movie at home on Friday night when I said I was going to stay up a little longer to watch the start of a race (a time trial, really) that would begin at 11:45 local time. Kat thought I was nuts, but after months of training and preparation and secret shoe development, three runners were going to take a shot at running 26.2 miles in under two hours. It wouldn’t be an official world record because of the insertion of fresh pacers every 1.5+ miles (and a pace car throughout) but it would still be an amazing feat if someone managed it. I’d been following this effort casually, largely via Ed Caesar’s (@edcaesar) great articles about the run-up in Wired, so I wanted to see what this would look like. You know, the first 15 minutes or so. So we watched. And the ballet of the pacers and the beauty of Eliud Kipchoge’s running kept both of us up for the whole thing. Yeah, we watched the three people run in a short and not-at-all-scenic loop for more than two hours. And when we weren’t watching Kipchoge look gorgeous every step of the way, we watched some advertorials and listened to some pseudo-science and groaned through some hyperbolic commentary. Anyway, you can probably tell by the title above that the two hour barrier didn’t get broken that night. But it was still worth staying up well past our bedtime, and the National Geographic documentary is well worth an hour—only an hour!—of your time. And Eliud Kipchoge is about as far from a loser as I can imagine. Hi! After a long hiatus from blogging and site updating, we’re back with both…and now at least the site will be responsive. (I’ll try too!) I hope you like it, and can find stuff, and that it works well for all your G.T. 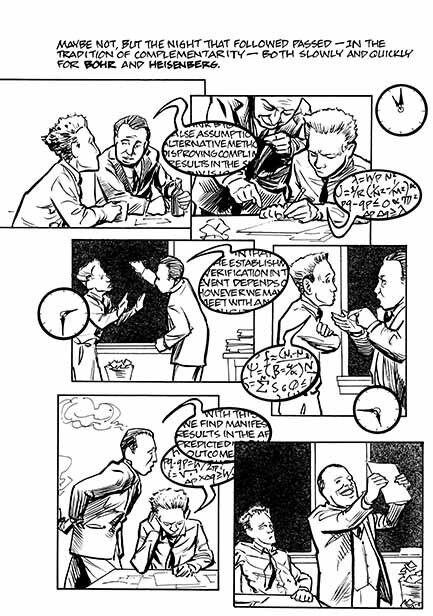 Labs and science comics needs. I think it will for mine. Many thanks to my friend Jane for getting me here. Of course a website refresh isn’t newsworthy at this point in history. It’s not like we’re living in the world of The Americans, where “ARPANET” is invoked like it’s a magical and mysterious thing. Which it is, if you think about it for even a second. (And for the worst cross-over ever, imagine Harry Potter sneaking onto that show and yelling Arpa Net, causing all the mainframe tape drives to spin out of control.) But it’s also mundane and commonplace too. So what remains that’s magical and mysterious while also being the very definition of mundane and commonplace? 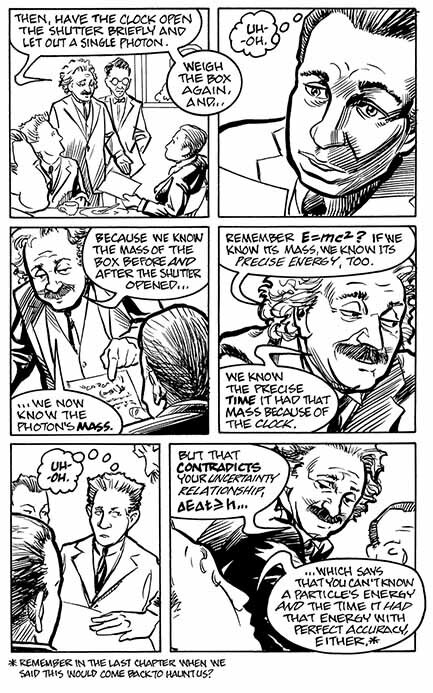 Quantum theory! And that’s where the new background image comes in. 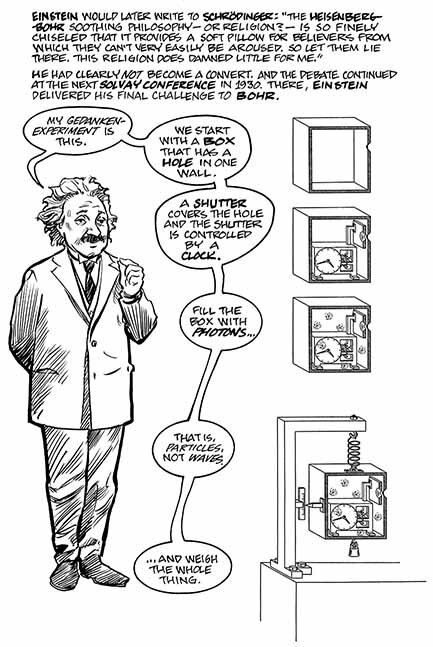 This is the rendering of Einstein’s clock-in-a-box as it appears in Albert Einstein: Philosopher-Scientist, edited by Paul Arthur Schilpp (1949). 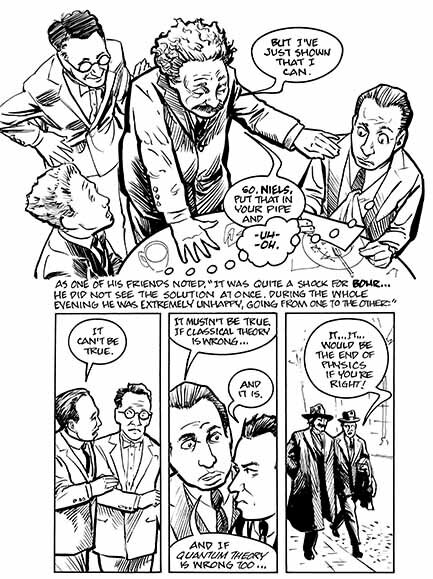 No credit for the artist, but I infer from the text that it was commissioned by Bohr himself, and as a collector, that would be a drawing I’d love to have the original for. 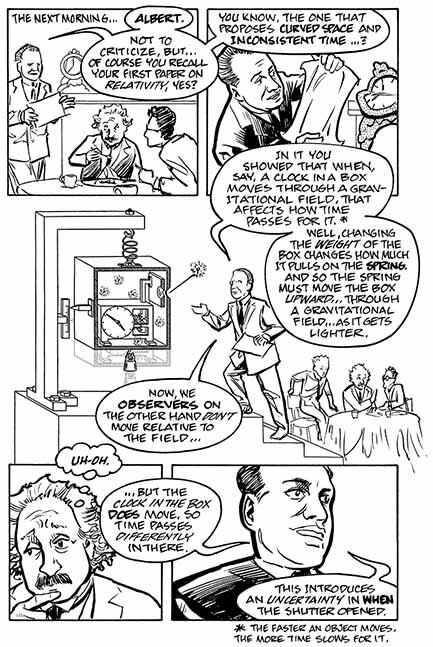 It illustrates a thought experiment he posed to stump Niels Bohr and his fellow quantum theorists in Einstein’s ongoing effort to demonstrate, once and for all, that this quantum stuff was nonsense. The bunk. Just Plain Wrong. 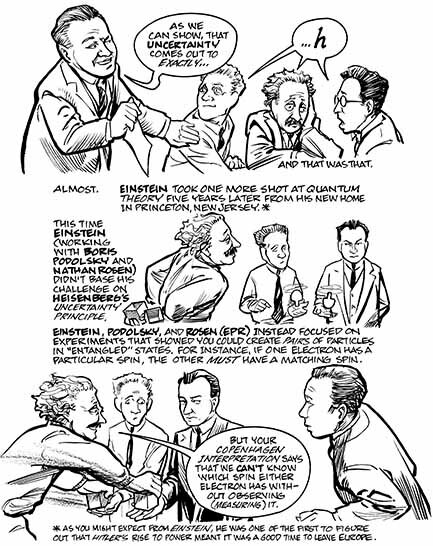 Bohr had dispatched most of Einstein’s previous objections with relative ease, but this one made him sweat. 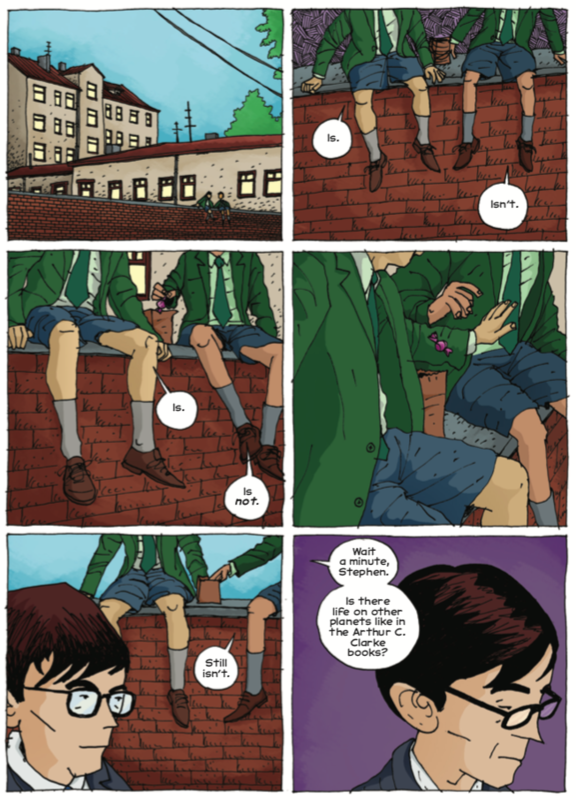 Here’s how the scene plays out in Suspended in Language, which you can buy right here on this site, or from great booksellers everywhere. 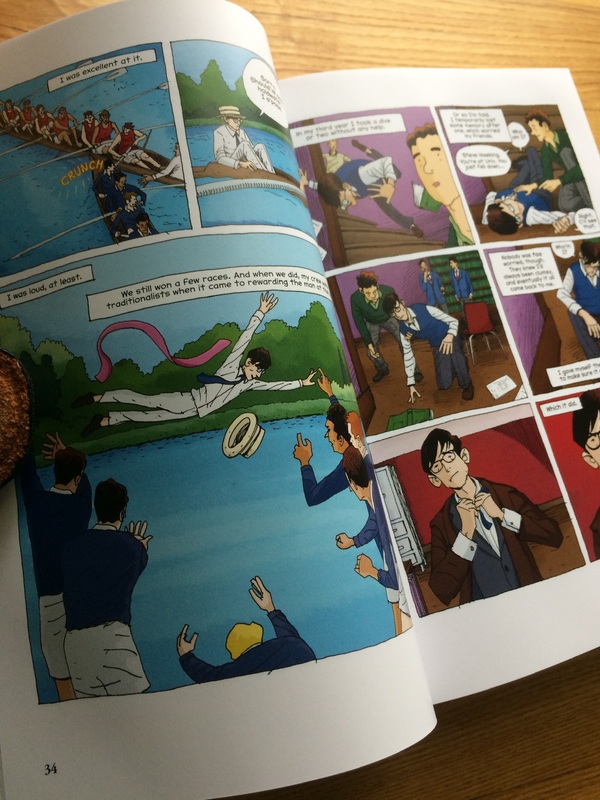 The Imitation Game: Signed copies from Nicola’s! Hey, do you need the perfect* gift? How about a signed copy of Leland Purvis and my NYT Best Seller The Imitation Game, delivered to your doorstep by someone in a great looking uniform? Nicola’s Books here in Ann Arbor has you covered. Just click right here and you’ll be all set for a birthday, Gift-Giving-Holiday-Of-Your-Choice, or a treat for yourself. You provide the lover of science and/or comics and/or history and we’ll do the rest. *Full disclosure: It’s not the perfect anything, but I’m really proud of this book**, and proud to work with Lynn at Nicola’s to make this happen. **You can learn more about the book on my site, read some of the reviews, and download a sample as well.